Shortly after we moved, I was feeling a bit homesick and even though we are by the sea here in North Down, I was aching for my Wicklow coastline. 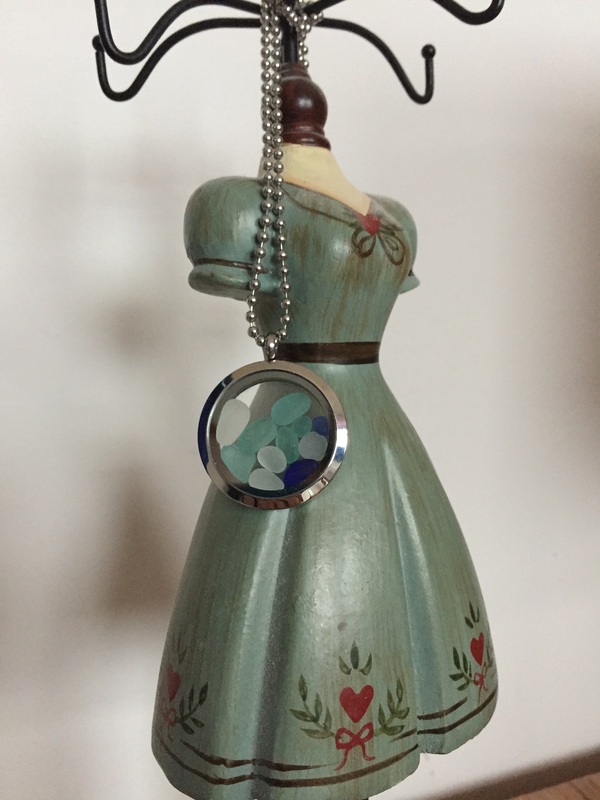 So I decided to treat myself to a piece of Seabloom Art – a gorgeous pendant with sea glass collected from the shore close to where I’m from. 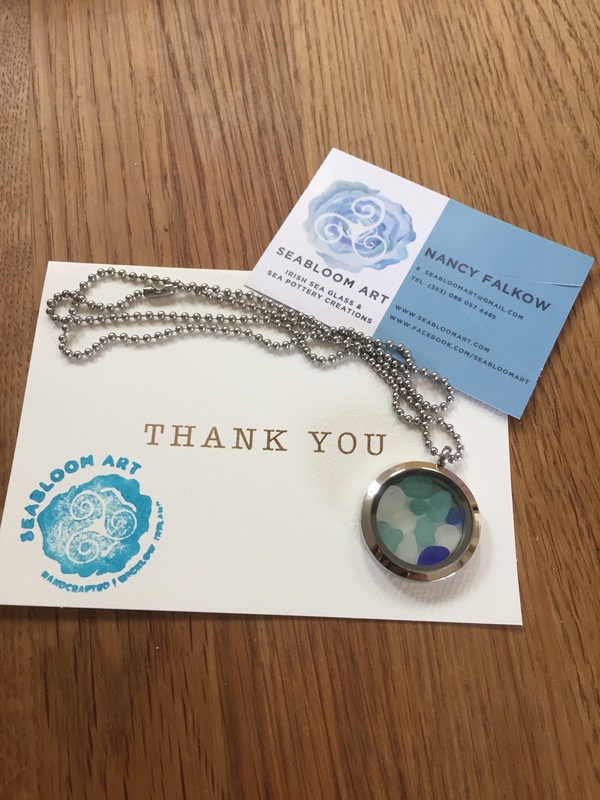 Nancy Falkow’s beautiful creations have been gifted to many friends over the years. I bought her little bookmarks as gifts for teachers and her pictures as presents for friends overseas. I bought a similar necklace for a dear friend who had moved inland in France away from the azur blue of the Mediterranean. Nancy’s work is just delightful and all her pieces are unique. She brings such imagination and joy to her work and she finds such treasures that she then creates into wonderful works of art. Her work is displayed in local galleries in Wicklow and has travelled far and wide. 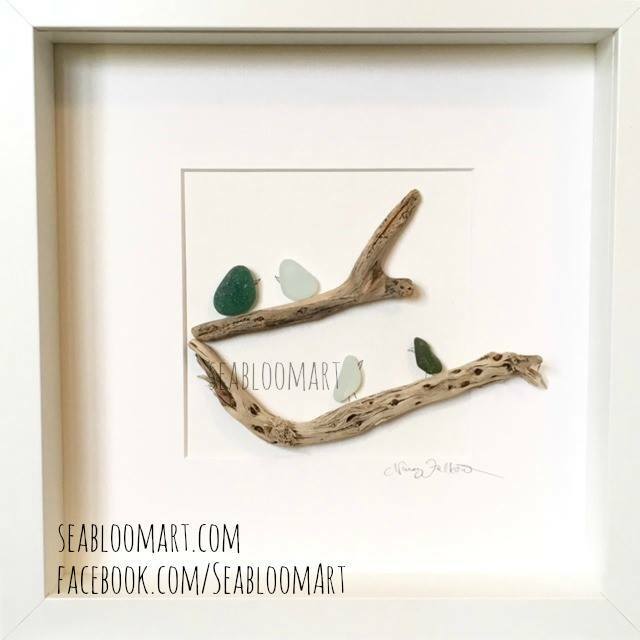 Follow Nancy on Instagram @seabloomart or go to www.seabloomart.com to buy direct via her etsy shop. Thank you Nancy for sending me a little piece of home. I will treasure this always. This painting of a snapdragon is an early painting in a series that Georgia O’Keefe became famous for. She said she wanted to paint flowers in close up to slow people down, to force them to examine the small in detail. The centre of the red flower is opening, yawning like a wet mouth, a tongue or lips. It could almost be belching. The surrounding petals are engorged, their fullness stretched to bursting. Wrapped around the flower at the far edges are pathways of purple, teal and turquoise blue, enveloping or embracing the red. Or perhaps the flower is pushing its way out of the dark, grown too big for its underground home, reaching for its true belonging in the path of the sun, reflected in that thin clitoral strip of yellow at the centre. The painting is O’Keefe at her most sensuous and feminine. I came across it at an exhibition in Dublin while my mother was dying of cancer back in 2007. I brought the book with me into the hospital for her to look at something beautiful. I had been told that the colour red was good for a tired psyche and Mum was exhausted battling for her life. I can’t know if it was the colours or the fact of time spent together quietly sharing beauty that revived her that day. After she died, I inherited the book along with all her others and I’ve cherished this. When I look at it now, I sense a more dangerous quality, the way it seems to be intruding in the space, taking space, something that most women balk at. I have always loved the singularity and determination of O’Keefe as an artist; her devotion to her craft, her honouring of her vocation at great personal cost sometimes. She was determined to do her own thing, live her own way and I have always admired that quality in her, longing for more of that bravery in my own life. Purple is also an important colour to me. I have always associated it with spirituality and higher purpose and I see the purple in this painting as wrapping and supporting the red flower. Red speaks of passion, anger, love, and also a warning of danger. There’s a ‘too muchness’ about it and as women we’re often told that we’re too much, too sensitive, too angry, too real. Red Flower reminds us to stay in our power and our majesty, to celebrate who we are and not hide behind some idea of ‘niceness’. Slow down, get up close, pay attention, make your art and then open up, burst forth, embrace the red, know you are circled in purple. Be a red flower.